As the number of coffee shops explodes, their distinguishing features seem to diminish. It makes finding that special mood, for that special someone, as difficult as finding a decent brew itself. While for many the word will conjure images of latte and cappuccinos, for one beachside business down in Woljeongri, Gujwa-eup, it means the novel combination of handmade cosmetics, health foods and, more predictably, hot beverages. Jeju Love is a local social enterprise seeking to tell local stories through multitalented artisans, some of whom are disabled, who combine their love of organic nature with cosmetics. 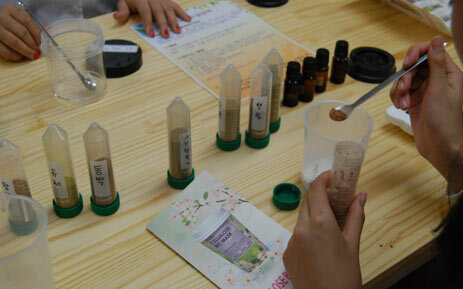 The result is a series of unique products such as scoria rock facial creams, cactus soaps, mandarin and cactus granules, and organic teas. Its affiliated cafe, “Cafe Jeju Story,” also provides a selection of tour courses for customers. Course A allows you to visit the gardens and take photos; Course B gives you a hands-on class in making cosmetics, such as scoria pore packs; and Course C serves up edible flower abalone rice and face-pack and perfume-making. So, take your special someone there and you are pretty sure to be coming out smelling of roses.